Kitten's Winter is here! And it's cute! We had read Kitten's Autumn when it came out and so when I was asked if I'd like to take a peek at Kitten's Winter , of course, I said yes. I included this read with our Christmas/winter books towards the tail end of December and we've read it several times over since then. 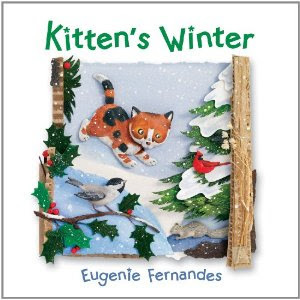 As I explained when talking about Kitten's Autumn, Fernandes illustrates her books with a "multimedia collage" so the pictures are quite unique and interesting to look at. Sometimes you know you are looking at clay figures and sometimes a paper cut-out. Her work gives the pictures a 3-D feel in a very artful way, if I do say so myself. The "story" in the book is told in rhyme and each page features Kitten who sometimes has to be looked for very carefully as he is hiding somewhere in the scene. Very, very cute and we highly recommend it for a fun winter picture book read! Thanks, Kids Can Press, for shooting a copy of this title my way! I love finding new titles to add to my collection. There's nothing sweeter than to curl up with a grandbaby and read the afternoon away. Aww.. I assume the kitten is playing in snow. I realized after Christmas that our snow book collection is severely limited. I will be correcting that.